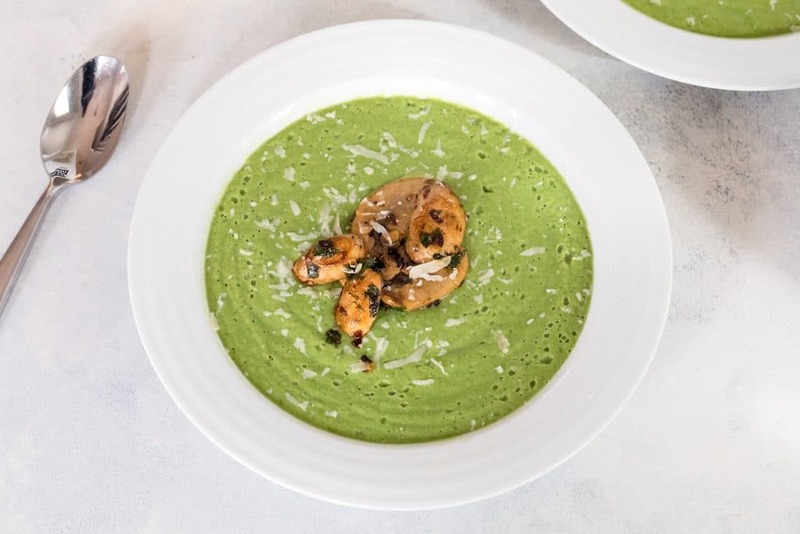 This healthy Broccoli Soup with Sauteed Mushrooms is packed with flavor and nutrients and made creamy with a little bit of Greek yogurt. See? Healthy eating isn’t so bad, after all! Sooo, have you guys started your healthy eating kick yet? I have not. Oops? What have I accomplished so far in 2018? Well, if you want to know the truth, I have watched the entire Vanderpump Rules series. To be fair, I actually started it in December in a quite leisurely fashion, but then I got my husband sucked in (muhaha) and when he binge watches TV, he binge watches TV. I prefer to take my time and savor my shows, but if I’m watching with him, we go all in and power through. And so, we did. And now I can’t decide if my life has been changed for the better or for the worse now that I have people like Jax and Kristen and Stassi in it. Also, Britney!! What the heck are you doing?? In any event, I clearly need a detox. I know it’s only mid-ish January, but when you feed your body with Vanderpump Rules for weeks at a time, you need some vegetables and healthy food to balance things out ASAP. I first made this broccoli soup years ago, but I went back and refined it a bit and made it even better. The thing is, when you search the internet (does saying it like that make me sound 95 years old?? ), there are a ton of broccoli soups, but a lot of them involve cream and/or cheese and are not actually healthy broccoli soups. And if I’m going to be eating soup made with broccoli, I want it to be a healthy broccoli soup. Otherwise, I’ll just order a pizza and have a side of broccoli, thank you very much. Not only is this broccoli soup pretty darn healthy, but it also takes about 10 minutes to make. I’m not lying. 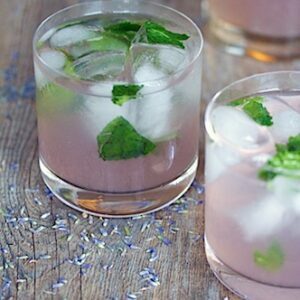 That means you have no excuse not to make this on a busy weeknight. You could probably even whip it up in between Vanderpump Rules episodes… Unless you’re watching on Hulu and the episodes don’t have commercial breaks in between them. In that case, just wait until you’re done with the series. NBD. Pretty sure Chris was a little skeptical about me serving him a big bowl of healthy green soup for dinner (though he does happily drink green smoothies several times a week! ), but then was pleasantly surprised. I’ll admit I added in more red pepper flakes than specified here to make it extra spicy for him. I also sprinkled a little bit of parmesan cheese on top. Totally optional, but I pretty much never turn down cheese. I’ve made this a few times now and while the sauteed mushrooms are delightful, if you’re feeling lazy, you can skip them. Instead, you can feel free to top the soup with a little bit of crumbled feta cheese. If you’re not on a cheese-free diet, which omg I don’t think I could ever do. When it comes to healthy eating for me, I’m all about adding in healthy foods instead of eliminating non healthy ones. I figure I’ll try my best to fill up on the healthy and then treat myself with whatever I choose. Elimination doesn’t work well for me. Especially if it’s cheese. Don’t take my cheese away unless you want me to be miserable. 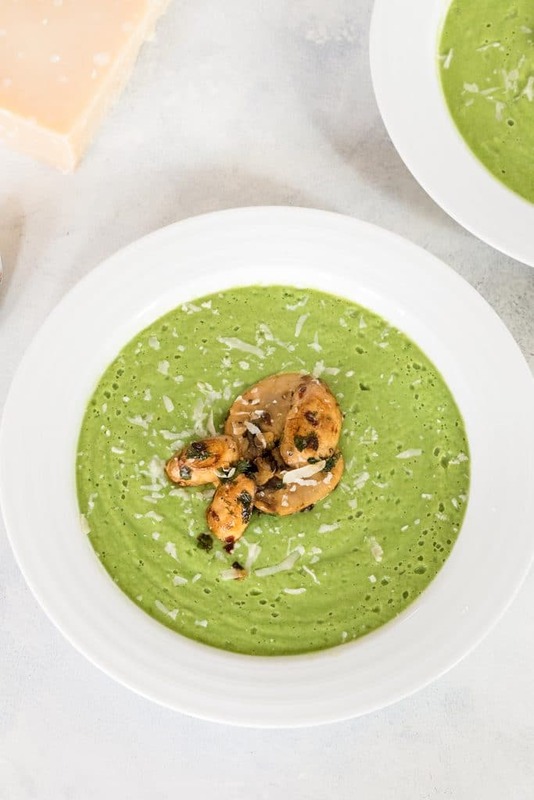 But give me healthiness like this broccoli soup and I’ll gobble it up with a little bit of parmesan or feta and then be too full to chow down on an entire block of cheddar. It’s science. Really though, this soup has been pleasantly surprising me, too. 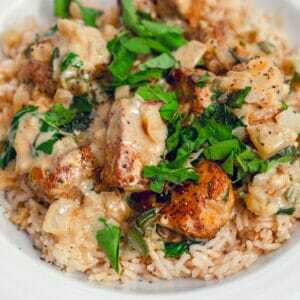 It’s creamy and incredibly flavorful with lots of depth… And healthy! Because if you’re eating broccoli soup, it should be healthy. When you can have a meal this vibrantly green NATURALLY, you know it’s going to be both delicious and healthy. Take advantage of that. And then go back to filling up on trashy television. And maybe a cookie or two. Have you been getting in some healthy eating in 2018? 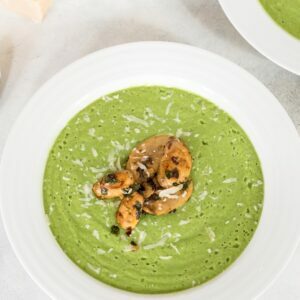 This healthy Broccoli Soup with Sauteed Mushrooms is packed with flavor and nutrients and made creamy with a little bit of Greek yogurt. Bring a large pot of salted water to a boil and cook broccoli florets until they start to soften, but are still bright green (about 4-5 minutes). Drain broccoli, but be sure to reserve about 3/4 cup of the water. Put broccoli in a blender along with 3/4 cup of reserved water, vegetable or chicken broth, Greek yogurt, 2 tsp minced garlic, 2 tsp lemon juice, 1/2 tsp red pepper flakes, 1/2 tsp salt, and 1/4 tsp pepper and puree until smooth. Heat olive oil in a medium saucepan over medium heat and add mushrooms, remaining 1 tsp minced garlic, remaining 2 tsp lemon juice, and remaining 1/2 tsp red pepper flakes. Cook for about 4 minutes. Season with about 1/4 tsp salt and 1/4 tsp pepper. Add parsley and toss. 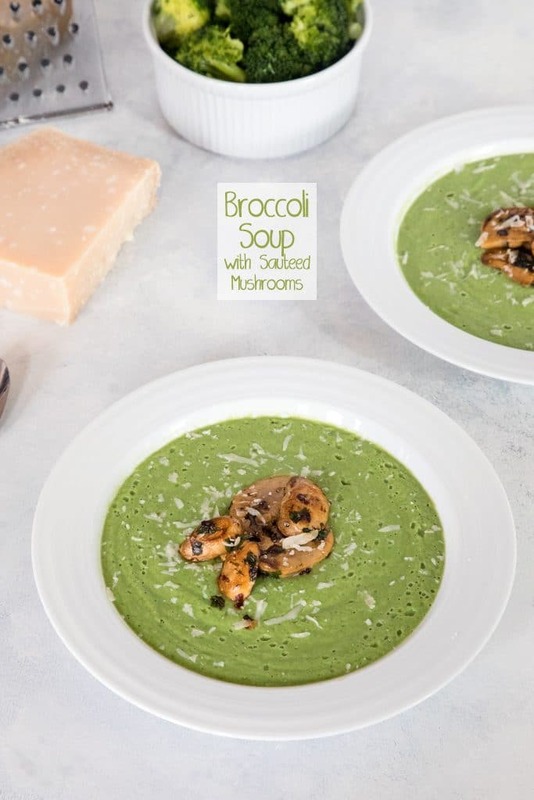 Serve broccoli soup in bowls and top with sautéed mushrooms. Sprinkle a little parmesan cheese on top, if desired. 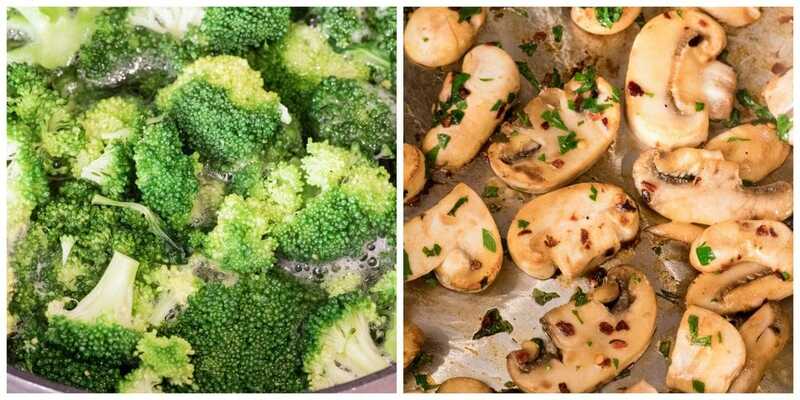 28 Responses to "Broccoli Soup with Sauteed Mushrooms"
I am not a big fan of broccoli but I’m liking it in the soup.I should give it a try! 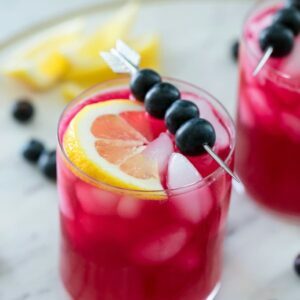 This recipe is so elegant. Perfect for a rainy day. But you should try making your own pesto…or even experiment with different types of bread toppings. It’s really fun. that soup sounds terrific – esp. with some cheddar cheese on top!!! wow nice work with that soup, and yes, I am definitely drooling over that pesto! Yum. I seem to love every green soup I try. I like making my vegetables into “fries” in the oven. So tasty! I am definitely saving that soup recipe! Not that I need to detox or anything…………. I’m a huge fan of Pestos with Panache, especially the fig and gorgonzola one! I love this soup idea! Always looking for new easy weeknight dinner ideas. I’ve never tried Pestos with Panache but they sound so good! Must get my hands on some! @Redo My Shoe- Yes, I LOVE making my own pestos!! But I also love keeping Pestos with Panache in my fridge when I went a quick dinner and a fun spread 🙂 Pesto is probably one of my favorite things ever! Sauteed mushrooms? I’m there…I love the sound of this soup – I always love any soup that has broccoli in it in some capacity. And I’m with you…totally not ready to stop my baking spree yet. Obsessed and not just for the obvious reasons. Mostly because I feel like I could make this and eat the entire thing without feeling the least bit guilty. I am totally making this. I love healthy creamy soups, and I definitely need to bulk up on veggies after lots of meat and cheese these past couple of weeks! Yumm! I’m so excited for another veggie soup recipe! I love this recipe for zucchini soup. It’s healthy & SO easy! You just need 4 sliced zucchini, 1 onion chopped, as much garlic sliced as you’d like (2-5 cloves), chicken bullion cube, and water. All you do is saute the onion and garlic in olive oil then add the sliced zucchini and soften. Throw in the bullion cube, cover with water and boil. Then take an immersion blender or put in a food processor and blend till creamy! Oh, wow! I want to make this right now it looks so delicious. I’m going to try making lots of healthy soups in the next couple of months and am adding this one to the roster! This soup looks wonderful, beautiful pics. I puree veggies in a blender to make sauces and dressing, throw them in a food processor with seasonings for a veggie “rice” and usually have a collection if raw dips and sauces to try with them. Your broccoli soup is so pretty! Definitely better than a stir-fry. And congrats on getting engaged…so excited for you! I actually get cravings for broccoli pretty regularly but I’m always trying to think of new ways to eat it. This sounds perfect. Maybe with a few tweaks on seasonings? I’m always looking for healthful recipes, especially those that involve vegetables. This soup really fits the bill! What a great flavour combination for a soup! 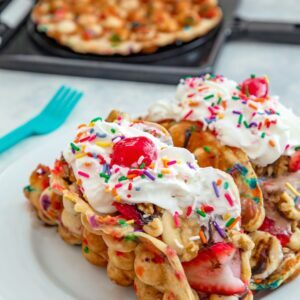 I like the use of the Greek yogurt to add creaminess! Great pictures! This soup not only sounds delicious but looks delicious as well! A perfect way to eat your vegetables. I literally have every ingredient for this soup in the fridge – except for the mushrooms…..I know what I’m doing tomorrow! Yum! I love the colours as well! I just book marked this – can’t wait to make it for the cold days ahead!! I made this soup as soon as I got home from work today. I’m not a fan of mushrooms, but they are great with the lemon, garlic, and pepper seasoning. I don’t think I added enough Greek yogurt, which is a healthy way to add creaminess to any soup. Overall, it is a delicious soup that’s easy to make. I would definitely make it over and over again!